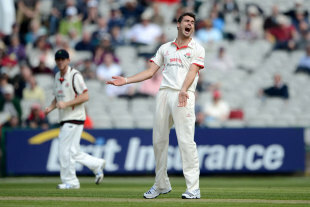 While his England colleagues Tim Bresnan and Stuart Broad were quickly enjoying considerable success in their first forays into the Championship season, James Anderson had to bide his time before finding rewards with the second new ball on a day where Lancashire took control with an impressive all-round bowling performance. Anderson got through five spells of varying length and looked in fine fettle, generating bounce and movement off a surface that was far more docile for the other bowlers. He was convinced he had Robert Key caught behind early, but had to wait until his 19th over to open the wicket tally when he breached the defences of Mike Powell, who was earlier dropped in the gully on 6 and had been holding Kent together with a stubborn 57. He then added Matt Coles, the England Lions allrounder who was banished from the winter tour alongside Ben Stokes, when he pulled obligingly to deep square-leg as Kent lost 6 for 73 having been handily placed on 130 for 2 shortly before tea. On a day where Lancashire's success came from their collective efforts, the individual bowling honours went to Kyle Hogg, a player who, unlike Anderson, has never quite lived up to the potential he showed early in his career. He was, in fact, part of the same England Academy intake as Anderson in 2002-03 - when it was based in Adelaide - and the story goes that when Anderson was called up to the full squad in Australia there was a suggestion the selectors should have gone for Hogg instead. Hogg, though, has never quite threatened an England career but has put in good service for Lancashire over the last 10 years. Yet he was not certain of his place for this match, a late decision coming down to a choice between him and Wayne White to accommodate Anderson. "I was probably a bit lucky we had that Yorkshire game last week where I batted and bowled pretty well," Hogg admitted. "We've got a good squad and everyone is expected to fight for their place." Hogg made the opening breakthrough in the fourth over when he trapped Sam Northeast half forward and after lunch pinned Key, who during the morning needed assistance in replacing his box, in similar fashion. Lancashire's attack was supremely accurate throughout the day - as supported by the tally of 19 boundaries, although a slow outfield also played a part in that - and it was not until midway through the afternoon session that Kent were scoring above two-an-over. "We bowled well throughout the day and got our rewards in the last session," Hogg said. "You look at their team and it's packed with good batsmen and you want to build pressure all day long. It's no good letting them off, that's what we base our game around." Kent's policy was perfectly justified, especially after taking the brave decision to bat first on an overcast morning, but their lack of significant progress meant that should a clump of wickets fall they would be in trouble. However, it was not one of the frontline bowlers who began the slide, rather Steven Croft's part-time offspin, which trapped Brendan Nash lbw on the back foot. In the second over after the break Simon Kerrigan gained the fourth lbw of the innings when an arm-ball skidded on to Daniel Bell-Drummond. Hogg was then recalled to the attack and struck with his first ball when Darren Stevens nibbled outside off and was well caught by Gareth Cross diving one-handed in front of first slip. Glen Chapple, who demoted himself from the new-ball role due to Anderson's return, took Geraint Jones' off stump as a wobble became a full-blown collapse. Research, although not fully verified, suggested that this was the first time since 2007, in a match against Durham, that Chapple had not taken the new ball when he had played in a Championship game. "I thought I'd be bowling after an hour," Hogg said, "but Chappy said I was taking the new ball with Jimmy. Chappy's record and Jimmy's records speak for themselves, it sometimes puts you under a bit of pressure not wanting to let the side down but you just have to back yourself."